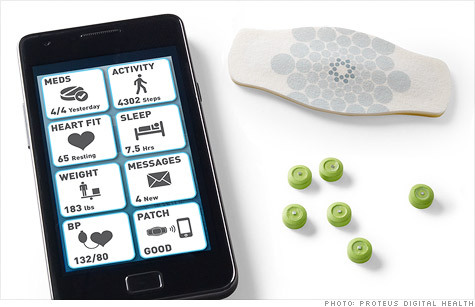 Proteus Digital Health's monitoring system includes a mobile app, pills with embedded chips, and a stick-on patch that tracks your body data. NEW YORK (CNNMoney) -- Ever wonder if you remembered to take your pills this morning? A medical tech startup has a novel solution: Swallow a computer chip that will help you keep track. Proteus Digital Health scored a big victory this week when the U.S. Food and Drug Administration granted approval for the company's "ingestible sensor" invention. The 1 square millimeter device -- roughly the size of a grain of sand -- can relay information about your insides to you, and if you choose, to your doctor or nurse. The chip works by being imbedded into a pill. Ingest it at the same time that you take your medication and it will go to work inside you, recording the time you took your dose. It transmits that information through your skin to a stick-on patch, which in turn sends the data to a mobile phone application and any other devices you authorize. The system's goal is to overcome our forgetful impulses, says Andrew Thompson, the CEO and cofounder of Proteus. "People live busy and complex lives, and as a result often don't take their medicines correctly," Thompson says. "We wanted to develop a solution that would help make existing medicines more effective in real life." The European Union approved Proteus' system device in 2010, according to the company. The Redwood City, Calif., company plans to bring its first product, called "Helius," to market later this year in the U.K. in partnership with the Lloydspharmacy chain. Helius includes Proteus' mobile health app, a supply of its stick-on patches (they last seven days, then need replacing) and a stash of its sensor-equipped placebo chips. The company declined to comment on the system's planned price tag. The first wave of Proteus products will rely on placebo pills taken at the same time as the patient's medication. The company hopes to eventually get its sensors built straight into common medications, Thompson says. Proteus' spent four years working through the FDA approval process. Now that it's got a green light, it plans to begin working on a U.S. version of its Helius system.